MOGADISHU, Somalia – An airplane carrying the last batch of 76 Somali prisoners released from jails in India has landed at Aden Abdulle International Airport in Mogadishu on Sunday, Garowe Online reports. 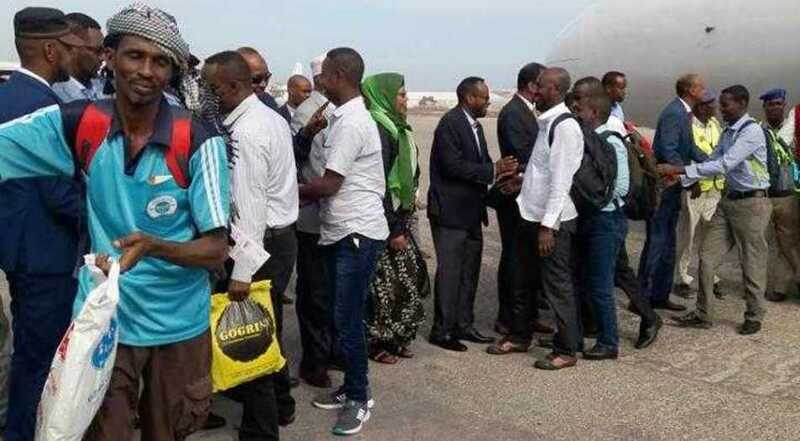 On Arrival, the detainees – all men have received a warm welcome from Somalia’s Deputy Prime Minister, Mahdi Mohmed Guled flanked by several Ministers, lawmakers, Somali ambassador to India and other senior government officials. Speaking to the reporters at the airport, Guled said the prisoners arrived Sunday in the capital are the last batch of 120 Somalis held in the detention centers India for nearly 7 years over piracy-related offenses. Last January, the Federal Government of Somalia welcomed home the first batch of the prisoners comprising of forty-one nationals who had been freed from Indian prisons, some have served their jail terms. Three of them are said to have died in prison from treatable diseases, including Tuberculosis (TB) because of lack of healthcare, according to one of the released prisoners who spoke to GO upon their arrival at the airport. The release came following prisoner swap agreement signed between Somalia and India last year. The returnees who were captured by Indian navy off the Somalia coast about seven years ago for suspected piracy activities have greatly thanked Somali government for their release. In the past few months, the Somali government has secured the release of scores of Somali nationals held in overseas jails, including neighboring Ethiopia and as well as Libya.